There is little better on this planet than making a room full of people laugh. It is an addiction that started when I was 10 years old, and not one that I am willing to give up. 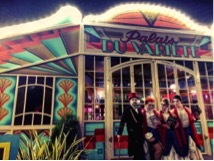 This Spiegeltent (called the Palais Du Variété) was amazing – hand built by a group of Belgian craftsman, and with a £800,000 price tag – it has a luxurious, bohemian, cabaret feel – a bespoke wooden theatre in the round, walled with mirrors, so that each smiling face becomes infinitely reflected. 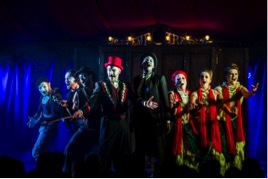 It has been an honour working among such a talented group of people on ‘The Vaudevillains’. All the cast play multiple instruments, one even taught himself ventriloquism for the show. Learning new things is one of the best things about being an actor. For ‘The Lion King’, I spent time at Colchester zoo, learning how to be a hyena. mime by Oli Lansley and James Seagar at LET, and puppetry by Disney’s Will Pearce and John Stefaniuk. Candida Caldicot (now at the RSC) taught me to play descant recorder, plus at NTC I learned how to play the spoons and harmonica and it is also where Gillian Hambleton taught me to play the flowerpots. Playing the fool, however, I learned all by myself.